This 255 page book shows intermediate to advanced CSS developers best practices for using CSS to design websites. The book brings together the most useful CSS techniques into one place. Rather than dig around the Web for that bulletproof centering technique or a three-column layout, this book gathers these techniques together into one edifying volume. The book is more than a compendium of CSS code, however. Best practices include source ordering for better SEO, background images and replacement, styling links with attribute selectors, creating buttons and rollovers with CSS (and saving HTTP requests in the process). You'll learn how to style lists, including the body id/class method to highlight the current page, create rounded navigation bars, sliding door tabs, image maps, and remote rollovers. Forms and tables are styled with CSS to good effect. Liquid layouts with two and three columns, complete with the Inman footer solution are explored. The hacks/filters and bugs/fixes chapters are worth the price of the book alone. Finally two real-world case studies show many of the techniques in action. The book pays tribute to pioneers who paved the way, reading like a who's who of the design world with Bowman, Inman, Meyer, and Zeldman all paid tribute. My only caveat is that the technical editing leaves something to be desired, with 11 pages of errata at the companion website. Perhaps Apress will create a second edition to correct these errors and update the book once CSS3.x is supported by Internet Explorer. Otherwise, this is an excellent book for web designers looking for the latest techniques. Recommended. Book companion website has sample chapters and errata. Intermediate to advanced users will learn how to create CSS-based websites with this book. 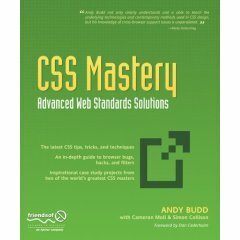 Gathers many useful CSS techniques into one edifying volume. By Andy Budd from Apress. Andy King is the founder of five developer-related sites, and the author of Speed Up Your Site: Web Site Optimization (http://www.speedupyoursite.com) from New Riders Publishing. He publishes the monthly Bandwidth Report, the semi-weekly Optimization Week, and Speed Tweak of the Week.